Mark Rothko felt that a painting was not just about an artist painting his own experience; it was also an experience for the viewer. His paintings needed us, the observers. Luminous colors seem to hover over the huge canvases. The rectangles seem to pulsate; they move. His colors quiver with the pathos of tragedy and ecstasy…emotions that ruled his life. Mark Rothko committed suicide at the age of 66 in 1970, at the height of his fame and wealth. His last paintings were the colors of tragedy: brown, dark blue and black. 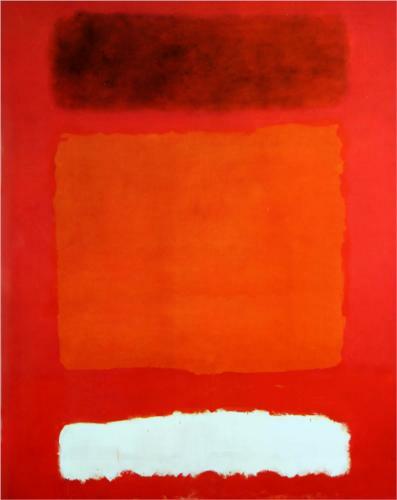 Watch highlights from the award winning Broadway play, “RED”, about Mark Rothko! Great blog, as always! Thanks girl! Well, he talks a good game, anyway — if the real Rothko was anything like the character in the play. Maybe he killed himself because he ran out of words and couldn’t come up with any more rectangle variations. That much passion inevitably burns itself out….and then what? Always love your blog. The first time I saw a Rothko painting, I thought “What’s the big deal?” Overtime I have come to appreciate his work and the emotion and energy of his work. Would love to see the play. Thanks for keeping us informed. It was always interesting hearing people’s reactions to his work when I was a security guard at The Cleveland Museum of Art (in college). People love to hate him. I always felt bad that people would dismiss his works and say they could easily paint what he painted. Thanks for sharing!! 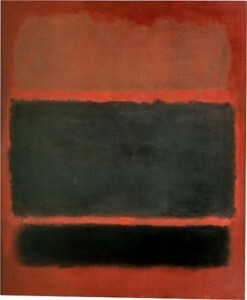 I am a Rothko enthusiast and “Red” is one of my favorite plays. Thanks for the Rothko entry; I enjoyed the comments. Have a look at The Independent (English newspaper) for today(15 May) p.25. Rothko’s Black on Maroon was vandalised 18 months ago but is now back on display in the Tate in London after a £200K restoration job. I enjoyed reading your posting on Rothko. The Rothko room at the Phillips Collection in DC is one of my favorite spots in the world. They did a building renovation recently, and I was afraid that they’d decide to dismantle the room or otherwise change it, but it’s still there in all its glory. It was fun watching Barret’s video. 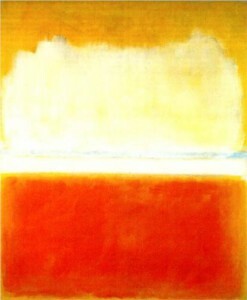 Colors make us think; some colors make us sad.I’m sorry Mark Rothko was not able to see the colors at the rainbow’s end. Sorry, but I just don’t feel ecstacy, nor passion, not even sadness. Tragic? Maybe yes. Just review his life, as portrayed. Sort of unfortunate. But hey! He apparently made into the big time of the art world. No small accomplishment. As for me, the art forms that touch me are not a big stretch. Rothko, I am sure earned his stripes. But, for me naugh. This was really edifying, Kirby. I naively tended to dismiss Rothko in the past. I better appreciate the impact of sheer color and all the metaphors we take for granted in this vibrant world of ours. his colors do invite an intense engagement.the very first painting could be a small nuclear explosion or a lava fire – has that amount of power. but this tragedy of a suicide – I think part of the artistic achievement is learning gratitude for the opportunity to be engaged in the process regardless of outcomes – we should savor that privilege of creative engagement for as many years as we are given. I am not a huge fan of abstract art but we went to the Rothko Chapel in Houston and even my eye rolling teenagers were spellbound by the huge canvases that seemed to undulate and draw you in. Take a seat in the Chapel for ten minutes and I guarantee it will move anyone.